It took 192 lasers and a building big enough to contain three football fields, but physicists have finally produced a pair of nuclear fusion reactions that created more energy than was in the fuel to start with. The reactions lasted less than a billionth of a second, and they released only a few thousand joules — enough to power a 100-watt light bulb for less than three minutes. But it marks the first time scientists have been able to harness the power of stars here on Earth. "This is really an important milestone, " said Warren Mori, a plasma physicist at UCLA who was not involved in the effort. The experiment, conducted at Lawrence Livermore National Laboratory in the Bay Area, is still a very long way from "ignition, " the point at which the reaction generates more energy than was required to kick it off with lasers. Scientists agree that significant hurdles remain before that goal can be reached. But the tests, described Wednesday in the journal Nature, give researchers a promising sign that they're finally on the right path to reaching this goal — one that could ultimately lead to cleaner nuclear energy, safer weapons arsenals and a more profound understanding of astrophysics. "We are closer than anyone has gotten before, " said study leader Omar Hurricane, a plasma physicist at Lawrence Livermore National Laboratory. Nuclear fusion is the process of combining the nuclei of two atoms to create a heavier atom, releasing an incredible amount of energy in the process. It's what powers the stars and generates their light. In some ways, it's the reverse of nuclear fission, which releases energy — and a significant amount of dangerous radiation — by breaking large atoms into smaller ones. Fission is used in nuclear power plants today. Hurricane and his colleagues used a comparatively simple fusion recipe. 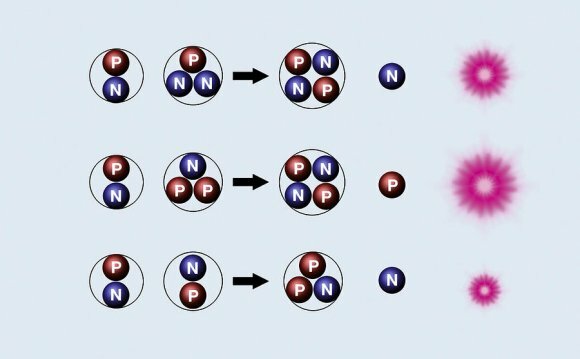 For their fuel, they used two "heavy" hydrogen isotopes: deuterium (which has one proton and one neutron in its nucleus) and tritium (which has one proton and two neutrons). When they fuse together, they create a single atom of helium (two protons and two neutrons), along with a spare neutron — and a massive amount of energy. In theory, that should prompt more atoms in the deuterium-tritium fuel to merge, triggering a chain reaction. It's similar to dropping a match on a pile of kindling — if you have the right match and the right wood under the right conditions, it's easy to make it burn. But outside of a star, it's very difficult to create the high pressure and high temperature needed to get the process going. "Mother Nature is pretty unforgiving, " Hurricane said. The scientists at the Livermore lab's National Ignition Facility tried to simulate the conditions in a star by using a formidable array of lasers to squeeze down and heat up a tiny jot of fuel. The lasers, arrayed around a cavernous building, shot high-energy beams through two tiny holes on either end of a pill-sized gold can. When the lasers hit the can's interior walls, the surface gave off X-rays that bathed an even tinier plastic sphere about the size of a small bead. The sphere contained a layer of deuterium-tritium fuel that was just 70 microns thick, barely the width of a human hair. With a precise combination of shocks from the laser beams, the pressure inside the sphere was several times greater than at the center of the sun. It lasted for about a seventh of a billionth of a second, long enough for the fuel inside to start fusing together, Hurricane said. After two runs of the experiment, the scientists measured the energy output by tracking the energy level of the spare neutrons flying out from the tiny sphere. The first one released 14, 400 joules of energy, slightly more than the 12, 000 joules contained in the deuterium-tritium fuel to start with. The second run was better: 17, 300 joules out for just 9, 400 joules in. Neither of these equations account for the 1.8 million or so joules of energy that streamed in from the lasers; when they're taken into account, 99% of the reaction's total energy was lost. But it's a start — one that points scientists down a path toward ignition and perhaps making nuclear fusion a practical reality, scientists said. "I think it's a promising advance, " said Mark Herrmann, a plasma physicist at Sandia National Laboratories in Albuquerque who was not involved in the study. "I was excited." Nuclear fusion would be a cleaner source of energy than the current generation of nuclear power plants because it produces relatively short-lived radioactive byproducts. It could also help scientists understand how to protect and maintain the military's nuclear weapons arsenal without performing full-scale nuclear tests, which the United States stopped doing in 1992.